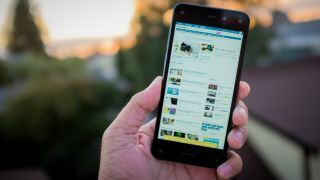 Amazon launched its Fire Phone in June last year in the US and a UK release followed at the back end of September along with a flagship price tag resulting in some poor sales, however the price of both storage versions of the phone have just had a £200 price drop meaning you can now pick one up for as little as £99. Amazon's phone launched a 32GB version at £399.99 and a 64GB version at £479.99 but each has now dropped to £99.99 and £179.99 respectively. If you decide to get one you'll be locked to O2 and you've got until May 22 to get one. Please read our review before you do so though, as we really didn't like it. After those horrific sales figures we can only speculate that Amazon is trying to clear out stock of the phone before announcing what it's planning to do next. Again, check out our full review of the Amazon Fire Phone.